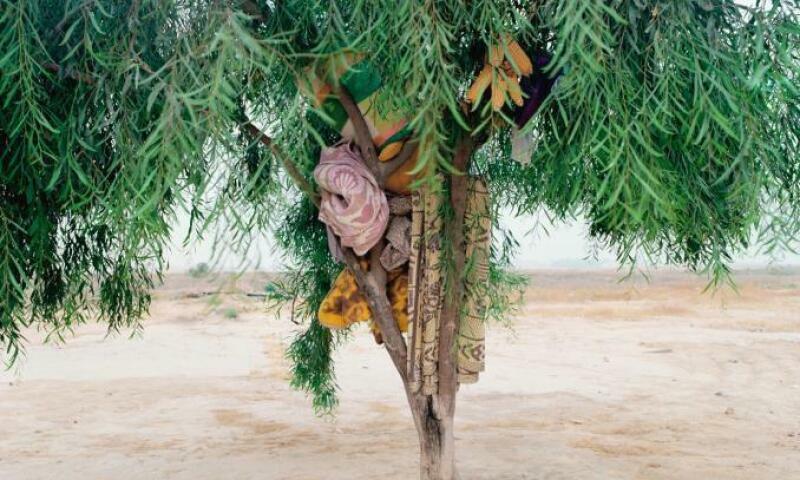 Ron Amir, Bisharah and Anwar's Tree (L'arbre de Bisharah et Anwar), 2015. Composed of thirty large-format photographs in color and six videos, the exhibition evokes the living conditions of refugees from Sudan and Eritrea while they were detained in the detention center of Holot, located in the desert of Negev and today closed. These migrants had fled to Israel to escape terror and oppression in their country of origin and were not allowed to live or work legally in Israel. Although they could move freely out of the center of Holot during the day, they were required to point morning and evening. Ron Amir's 2014-2016 photographs document the daytime activities of these refugees. They show how, in the middle of the desert, without resources, they tried to develop a common and daily life. Using sticks, sand, rocks and all sorts of abandoned objects, they have managed to build community huts, tea rooms, benches, gyms, improvised ovens and other equipment that comes complete the basic equipment planned for Holot. While the refugees themselves are not visible in the photographs, their creativity, survival instinct and sensitivity are evident in Ron Amir's depictions.What looks like a landscape photograph at first glance reveals itself in a second time as a witness photo, imprinted with the wait before liberation, living together and the hope of a home. One of the characteristics of Ron Amir's work is his active involvement in the life of the community he chooses to photograph - usually on the margins of the society around us. He started his photographic project in Holot with visits without a pre-defined goal, except to get to know the asylum seekers. From his first visits, the boundaries between political action and art began to blur. In contrast to traditional documentary or press photography, Ron Amir's photographs convey several messages simultaneously. They testify to the social distress while telling the abundant creativity of the people who undergo it. They are both a document and a metaphor. Closed, Mon., 17 Apr., 1 May, 8 May, 5 Jun., 25 Dec.